Saigon coffee shop meeting place for young Vietnamese out to make money because they can. This Vietnam veteran returned to Vietnam on a cruise these last two weeks, and what a revelation it was. Those places I visited regularly in Saigon (aka Ho Chi Minh City) are unrecognizable or gone. They’ve been replaced by high rise buildings. And the bicycles crowding the downtown streets have been substituted by 1000cc Hondo Dream motorbikes. Affluent families have as many as three. The old Intercontinental Hotel is far left dwarfed by new development. 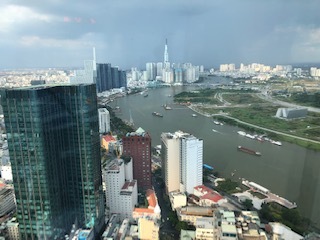 The Saigon River winds through a different city. Communism, capitalism, and entrepreneurship…Vietnam followed China. When the cold war ended, and the Soviet Union broke-up, Vietnam was starving and 15 years of pure collective planning had failed. By opening the people to enterprise and allowing small business incentive, the government gave the gift of self-actualization and self determination. Capitalism from the ground up within a iron structure works. Who knew? The qualities of entrepreneurship, self-empowerment, initiative, creative expression, and opportunity enabled a failed country to flourish. The place I left in 1971 has transformed itself into many motivated small business entrepreneurs proving the human spirit seeks expression, freedom, and profits. Each Vietnamese family maneuvers their motorbike around Hanoi and Saigon like swans in a water orchestra. How each avoids the other is a miracle. It’s the ability to make as much money as they can that keeps the average Vietnamese happy. The government on the other hand lurches forward by taking fees and forming joint-ventures with the big guys. This Vietnam veteran anticipated a visit to Hoa Lo prison (the so-called Hanoi Hilton), but alas 2/3 of it has been razed and replaced by a high-rise building built by Singapore investors. 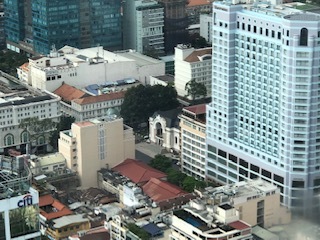 The photos above were taken from the 50th floor of the Texaco Saigon Tower. “A month spent travelling there at the beginning of this year – talking to farmers, intellectuals, academic specialists and veteran fighters from both sides of the line – revealed numerous falsehoods and compromises that have been forced on the Vietnamese people by the powerful in pursuit of profit. The US has succeeded in promoting a false account of the cause and conduct of its war. In spite of losing the military conflict, the Americans and their allies have returned with the even more powerful weapons of finance, forcing the Vietnamese down a road they did not choose. Now, it is their leaders who are telling the biggest lie of all. It is not clear how any economic model could have survived this hostile encirclement. Inevitably, Vietnam’s socialist project began to collapse. It adopted a crude Soviet policy that forced peasant farmers to hand over their crops in exchange for ration cards. With no incentive to produce, output crashed, inflation climbed back towards wartime levels, and the country once again had to import rice. In the early 1980s, the leadership was forced to allow the peasants to start selling surplus produce, and so capitalism began its return. By the late 1980s, the party was officially adopting the idea of “a market economy with socialist orientation”. The worst of this inequality is in the rural areas. Millions of farmers have been driven off their land to make way for factories or roads. In the early 90s, nearly all rural households (91.8%) owned land. By 2010, nearly a quarter of them (22.5%) were landless. A relentless tide of poor peasants has poured into the cities, where they have been joined by hundreds of thousands of workers who have been made redundant as the private owners of the old state-owned companies set about cutting costs. This wave of men and women has swirled into the “informal sector” – hidden away in sweatshops in private houses or sitting trading on the pavements – and into the sprawling network of new industrial parks and export‑processing zones. Meanwhile, healthcare and schooling are no longer free. The World Bank report noted that “incomes are beginning to matter more for determining access to basic services”, and that the government was spending considerably more on hospitals for the better off than it was on communal health centres for the poor.